Discogs Tagger script gets track/album information from Discogs.com or MusicBrainz.org . After installing the script you have to choose your favourite Tagger (Discogs or MusicBrainz) from options in the right upper corner. 1. Right click on the folder that contains the tracks of an album (release) or mark the files and click on "Auto-tag from Web". 2. 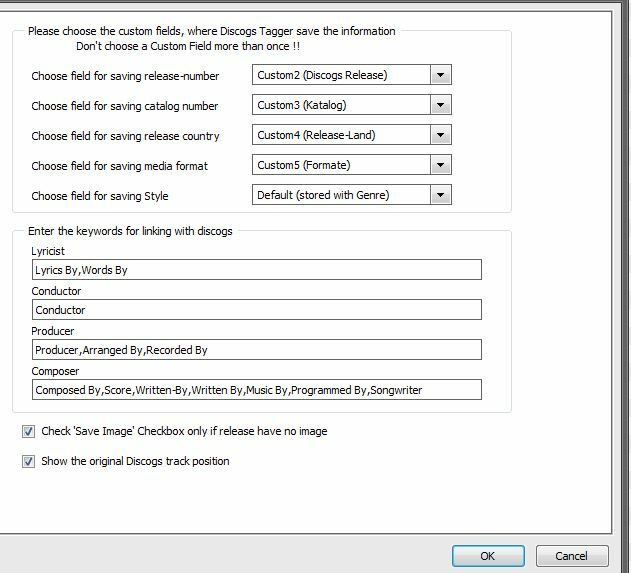 For enabling the script, you will need to select "Discogs Tagger" or "MusicBrainz Tagger" from options in the right corner (only once). 3. Discogs / MusicBrainz tagger screen will show up. 6. Once you save the options, they will be loaded as default on each time you make a new search. 5. New or different tags will be shown with a yellow background in the list at the lower end. If all music files are matching and correct then continue to next step, otherwise use methods described in section B and C.
1. If there are no results, or completely wrong results, problem might be the search string. Use "Quick Search" to change the search string. Although there are plenty of alternatives offered, it is possible to type into the bar at the top and click on search button. Hint: Searching unique identifiers such as barcode number, catalog number etc. will help finding the release. Or you use the Advanced Search button. There you can change the artist/album/track search string. 4. Matching can become impossible in case of tracks with exactly same names (eg: release with all tracks are "Untitled"). Strategy for such releases is to disable track# field combo box and leave track# as it is (which is better than putting a wrong track #) OR use the Discogs Batch Tagger, there you can move every track to his right place ! - Added the feature "Add leading zero (Disc#)"
- Leading/Trailing spaces will now detected and deleted in album-name, too. - Added check for image before try download it. - Added option "Don't copy empty values to non-empty fields"
- Changed delay function. Wscript.Sleep doesn't work on all clients. Starting August 15th, access to our search API endpoint (/database/search) will require OAuth authentication. We receive a large volume of anonymous search requests, and an overwhelming amount are failed requests (e.g., brute-force mp3 taggers), so we would like to be able to monitor these requests at the application level. This is part of an ongoing effort to improve API uptime and response times. If your Discogs application is already sending authenticated requests to the search endpoint, you do not need to update any of your code. If you use the search endpoint but do not authenticate with OAuth, requests to the search endpoint will fail beginning August 15th, so please make the appropriate updates to your application! From Version V4.46 the script using the OAuth authentication. 1. Create an account at discogs if you don't have one. 3. After successfully granting the script you can use discogs tagger as usual. The script store the access token in mediamonkey.ini. With this token it's not possible to change your profile / account at discogs ! - Added Sub tracks option. The Script know 2 ways to put sub-tracks together. Some albums at discogs have 'Index-Tracks'. - For the catalog-number, release-country and media-format you can choose "Don't save" in the option menu, if you don't need it. When you start tagging an album look at the left side. The script display the primary albumart for the release (Front-Cover). Choosing one of the two checkboxes (Large / Small) store this image. If more images for this release stored at discogs the script show the button "More images". The button opens a window displaying the other images. Checking the "Save image" checkbox under a image will store it after closing the Discogs Tagger window ! Choosing "yes" will storing the image(s). This is a new thread for the AddOn Discogs Tagger. Look here for the old thread. It is the successor of macrbest's Discogs Auto-tag Web Search Script. With compared to its predecessor, new version has additional capabilities such as direct release, master release, artist, label loading, individual track selection, filtering, alternative searches etc..
A big thanks go out to Let for maintaining this script for a long time and eepman for the help with the JSON-Parser ! Last edited by crap_inhuman on Mon Apr 01, 2019 3:13 pm, edited 83 times in total. Outstanding! Thanks for all you have done. "Being mean to someone takes more effort than being nice to them"
Is this script designed to update all fields regardless if it's already populated or not? Date & Original Date not updated in tag with existing different year already populated. 1984 already in both fields. 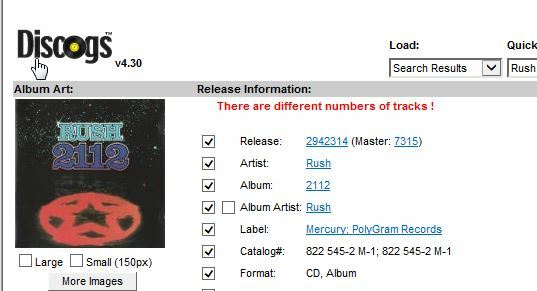 Discogs shows 1982 but when update tag is applied, data is not changed. I also have another example where my tag shows a disc # and if I update it to info not including the disc #, the existing data is not removed. Note: I have Earliest Date script installed also. I don't think that should impact this at this stage. It auto updates when the track starts playing. the script always update a field, except there is no updated information at discogs. I tested but i can't see the described bug with the date/original date tag. The date-fields always been updated, wether populated or not. Please do some more test with different releases and post the result. The posted Billy Idol release i also checked with the date-field. How you set the info not including the disc # ? Please post an example release number if possible. The co-existing of the Earliest Date script isn't the cause of. This is for the Billy Idol track. I'll provide additional data later. These are my settings and the result just before applying. There are 2 tags in MM for date and original date. In the Billy Idol example there is no date, so the script doesn't update the tag. The original date will not be displayed in the table of the script. You see it in the properties of the song. In the Billy Idol song you must see after the update date: 1984 and original date: 1982 Right ? My thought is that 1982 should be the update for the tag and 1984 removed. If the date in Discogs is blank, you're saying the incorrect date will remain instead of being removed leaving the field blank. Why isn't the 1984 removed in row 2 of "Select which files to update:" because it is an update? I saw the different selections for this album and I made this selection because it's the version that doesn't show "With Generation X" as part of the Artist name. I know I can just remove that piece, I just didn't understand why it's working the way it is. Maybe I have to much time on my hands. The field "date" is the date for the selected release at discogs. In the Billy Idol example the submitter didn't find the date on the cd and leave it blank. So you see no date here. Or is removing the 1984 the right way ? I need some help with the assignment of the Extra Artists in the script. Every album have extra artists (e.g. Composer, Producer, Lyricist...), but there are many similar names for the extra artists. I don't know all similar names for the extra artists.. 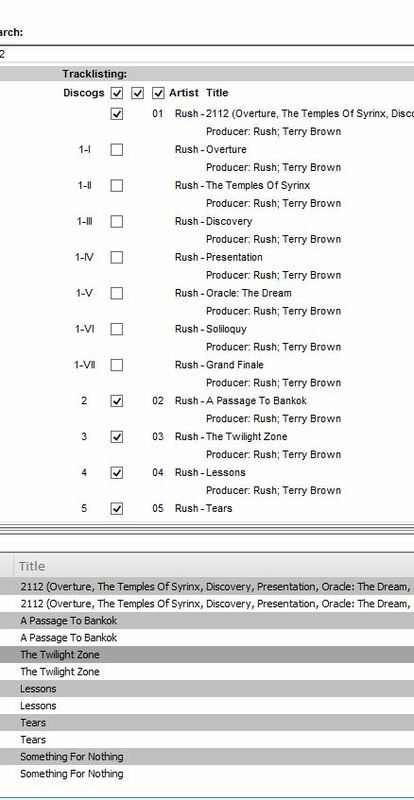 Example: The script puts all extra artists with the role "Composed By", "Score", "Written-By", "Music By", "Programmed By", "Songwriter" into the "Composer" field. I don't know if this list is complete, or a role is misplaced. In the next version of the script i will add an option to modify the assignments. Before then i want complete the assignments as accurately as possible. All other roles of an extra artist will be stored in the involved artist field. Please post your hints, opinions, ideas,... !! B.T.W. : I currently work on a check-discogs-batch script. 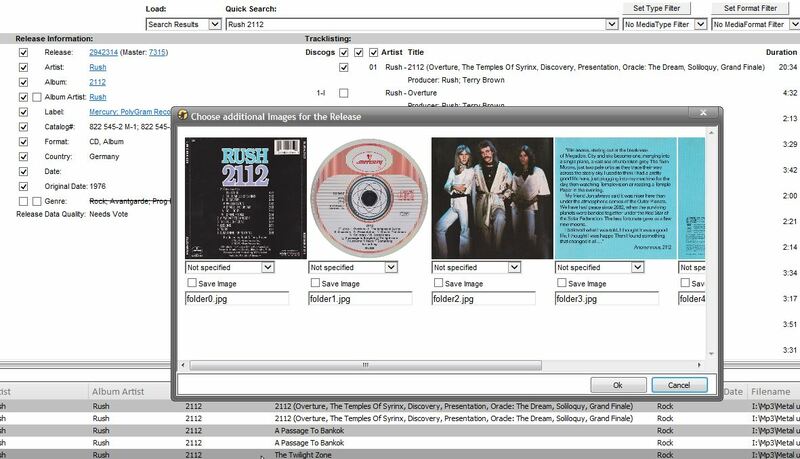 The script compare the saved information of an album with the information from discogs. So you can see if new/updated information are available for an album. You can choose more than one album at the time. The script use the saved release-number to get the information from discogs. I love the Discogs plugin and was wondering if it is possible to only pull the genre per album. I've tried playing around with deselecting the various boxes but am left with track info and genre. I don't want any titles changes, just genre. I've tried using the lastfm script but it is way out in leftfield. I am new to discogs tagger. I want to tag genre separatly to genre-style. Genre-style should be tagged in the custom Field 1. Is there any way to do this? eclecticlady wrote: I love the Discogs plugin and was wondering if it is possible to only pull the genre per album. I've tried playing around with deselecting the various boxes but am left with track info and genre. I don't want any titles changes, just genre. I've tried using the lastfm script but it is way out in leftfield. It is not possible to tag only the genre per album, sorry. Gast wrote: I am new to discogs tagger. I want to tag genre separatly to genre-style. Genre-style should be tagged in the custom Field 1. Is there any way to do this? There is a way to separatly genre and style,but i have to change the script. Give me some time and i will add the option. It would be great to separatly tag the style. Das wäre klasse, wenn es klappt. Bei meinen ersten tag-Versuchen hatte ich immer ein extrem gefülltes Genre-Feld. Danke für die Mühe. I released a new Discogs Tagger Version. See the first post in this thread for details ! Usually when I'm closing the window after trying to search. I've tried reinstalling with elevated admin too.